This article takes a closer look at ways merchants can utilize Facebook’s administrative console and Insights analytics platform for marketing purposes. These newly revised sections contain information that can help merchants gain a deeper understanding into (a) who is visiting their pages, (b) the types of content the visitors engage with, (c) the page’s reach across the Facebook ecosystem, and (d) how to improve the page’s performance. 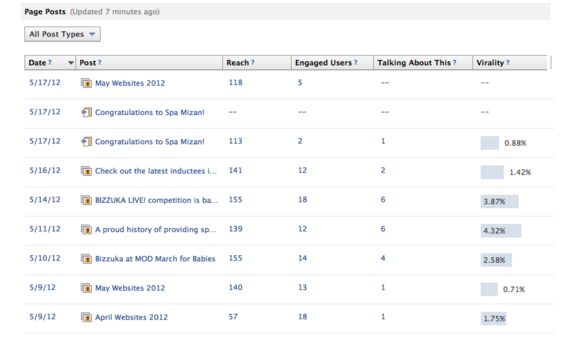 The Admin Panel provides a snapshot of page activity and engagement. The first thing page administrators see when they log onto their page is the “Admin Panel.” It contains a snapshot of the latest page activity and is divided into five parts. Notifications. This area lets admins know what posts to the Timeline page visitors have liked. Messages. Facebook pages now allow fans and visitors to send private messages to page owners. Messages that have been submitted will appear here. New Likes. This is a list of people who have liked the page itself. Insights. This is a thumbnail-sized graphic showing the number of posts, how many people have engaged with the content, and the content’s reach based on those interactions. Page Tips. Facebook uses this section to provide tips, as well as promote advertising messages. Administrators can remove the panel from view by clicking the “Hide” button located in the upper right-hand corner. Also, located to the left of the Hide button are three others. Manage. This lets administrators edit the page, see an activity log, and view banned users. Build Audience. Click this button to invite email contacts to the Page or create an ad. Help. This links to help files, a downloadable PDF guide about Insights, a step-by-step tour of the administrative console, and a learning video. The Admin Panel provides “at a glance” information. To gain a more comprehensive understanding of page activity and user behavior, click the “Insights” thumbnail graphic, which links to a page containing a larger version, along with other information. Insights provides comprehensive data about Page performance. 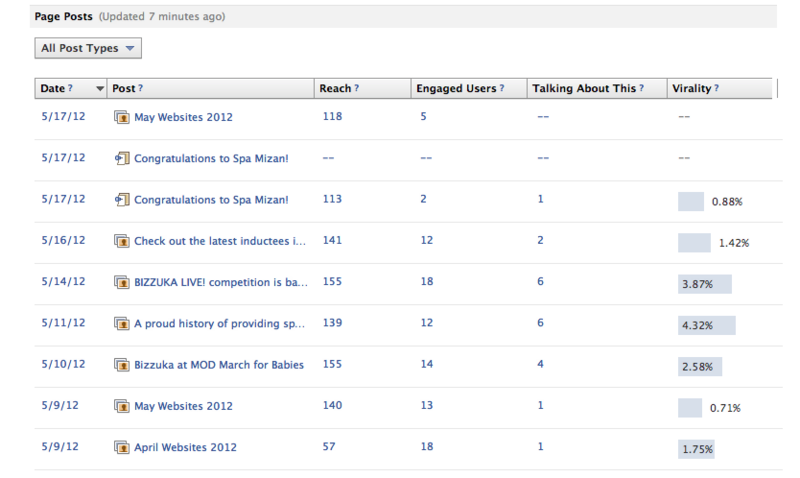 Across the top of the Insights page are four categories: Overview, Likes, Reach, and Talking About This. It is important to monitor these four metrics to assess the audience size and how it is engaging with page content. Total Likes. The number of unique people who have Liked the page. Friends of Fans. The total number of people who are friends of people who liked the Page. People Talking About This – The total number of people who have created a “story” about the page. This includes comments, likes and shares of posted content. 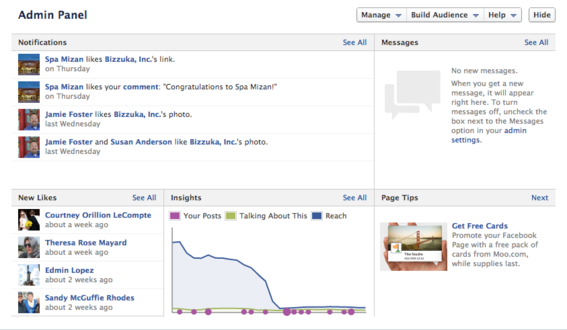 This is a snapshot of visitor activity on the page. Likes. This section contains demographic data of the people who have Liked the page and includes gender, age and geographic locations where visitors are coming from. This is valuable to help page admins know if they are reaching the intended target market. 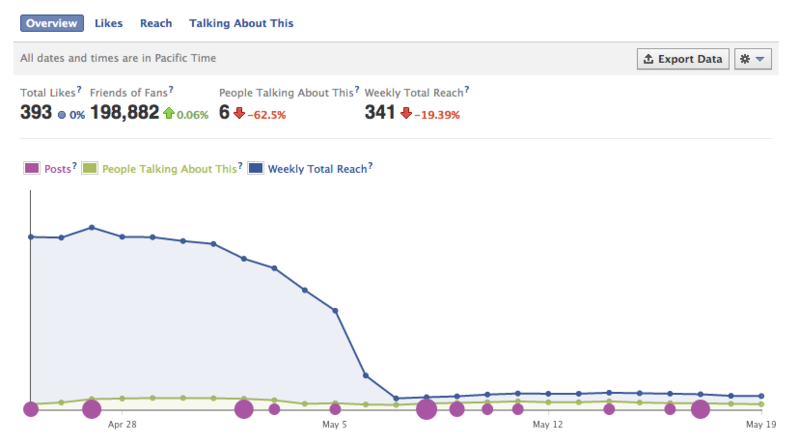 This graph contains demographic data about people who have Liked the page. Reach. 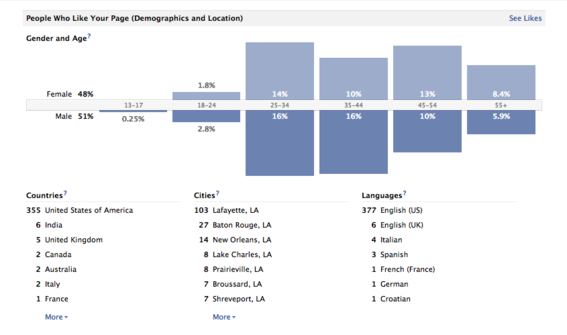 This portion contains similar demographics, but of those reached by the content, including fans and friends of fans. Talking About This. This area also contains demographic data consisting of people who have engaged with page content via a Like, comment or share. For an ongoing record of page activity, admins can export data to a CSV file. Click the “Export Data” button located in the upper right-hand corner of the page to begin the download. At the bottom of the Insights page is detailed information about activity related to Timeline posts, set in table format. The information can be sorted by category in either ascending or descending order. Understanding this data helps admins optimize the performance of posts to increase the page’s total reach and expand awareness about it. Page posts are a table containing data about performance of individual posts. All Post Types. This is a drop-down menu containing a sortable list of the various post types, such as photos, links, videos, status updates and questions. For example, to just see posts that contain video content, click that option and only those posts will appear in the table. This is a drop-down list of various post types. The table contains the following categories: Date, Post, Reach, Engaged Users, Talking About This, and Virality. Date. The date the post was created. Post. The post itself. Clicking the link will open a pop-up window containing information about the post, along with a link to view it in the Timeline. Reach. The number of unique people who have seen the post. Engaged Users. The number of unique people who have clicked on the post. Talking About This. The number of unique people who have created a story about the post via Likes, comments and shares. The more people that talk about the page, the more distribution it will get. Virality. The percentage of people who have created a story about the post compared to the total number of who have seen it. This is a indicator of the kind of posts the audience responds to. In each of these cases, data covers 28 days following publication of the post. There is more data than we have space to cover in this article. But hopefully this provides an overview of how the Admin panel and Insights analytics platform can help merchants better market to Fans and page visitors. The goal with any merchant’s Facebook page should be to find the types of content that people engage with the most, or which has the greatest reach and virality, and provide more of it.